The smoke cloud fading behind our house. Summer’s gone now. The trees are starting to turn. I saw a pair of brilliantly colored trees, red and orange, on my way down to Grand Rapids to drop the skelly paintings off for ArtPrize Nine. I’m sorry summer’s done but I’m enjoying the cool mornings for walking in the woods with my dogs and it’s nice having seasons again. Makes me think of football games, raking leaves and the smell of burning stuff in the air. Last week one of the neighbors had such a big burn pile going that it made a fog over our entire back yard. The sun was low in the sky and it lit up the smoke, throwing the trees in silhouette. Part of me was thinking, “I hope I don’t die as a result of all this toxic smoke in the air,” and the other part was thinking, “This is so cool looking!” I ran in to get my phone for a picture but by the time I came out again, most of the smoke had dissipated. I can still picture what it looked like, the branches all backlit and peeking through that huge cloud of smoke. 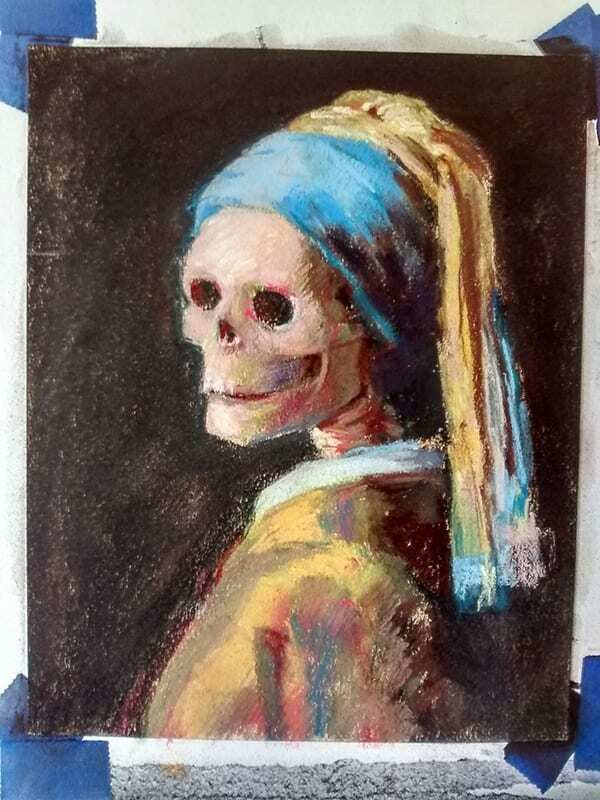 You’ll be happy to know all seven Old (Dead) Masters paintings are officially delivered to the bitter end coffeehouse and by this time next week lots and lots of people will have a chance to see them up close and personal. I’m excited and nervous and feeling a lot of dread right now. Kind of like I used to feel right before a particular fundraising auction in my previous life as a Rotarian. Back then I’d have nightmares about nobody showing up and then to add insult to injury, I’d get what I called my “Christmas Cold Sore” on the day of. It never failed. My contact at the bitter end wasn’t there when I arrived but his father, Mike, was. 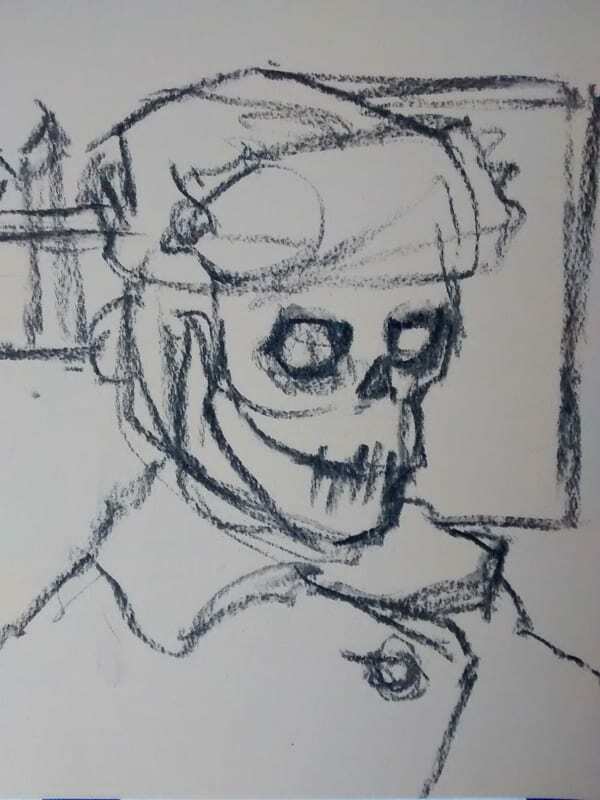 Mike told me that when he and his son, John, first saw the skellies they knew right away they were perfect for their place. I think I couldn’t have chosen a more perfect place to exhibit skeletons in, don’t you? Meantime, I keep feeling my lip for impending cold soreness. So far, so good. 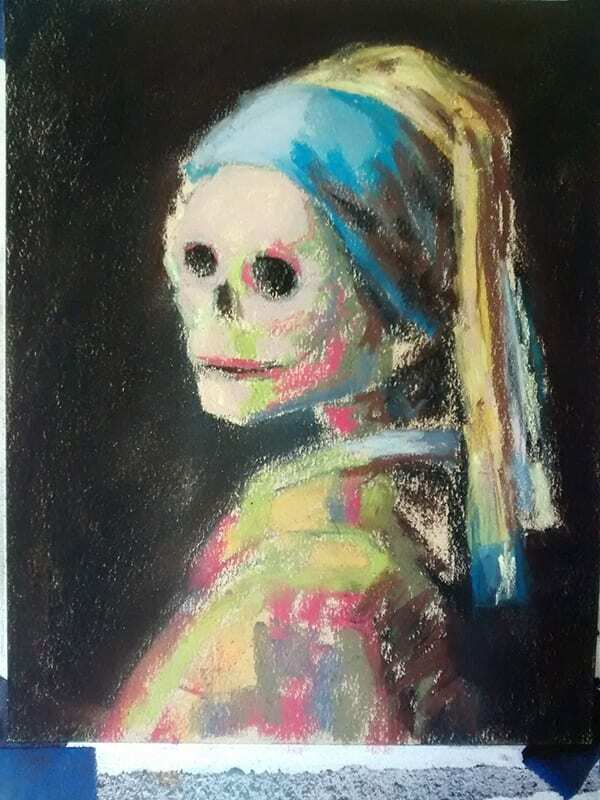 This entry was posted in art business, Old (Dead) Masters, Pastels, skeletons and tagged art, art prize, artprize, artprize nine, bitter end, old (dead) masters, painting, pastel, skellies, Skelly, spoof on September 14, 2017 by Marie Marfia. 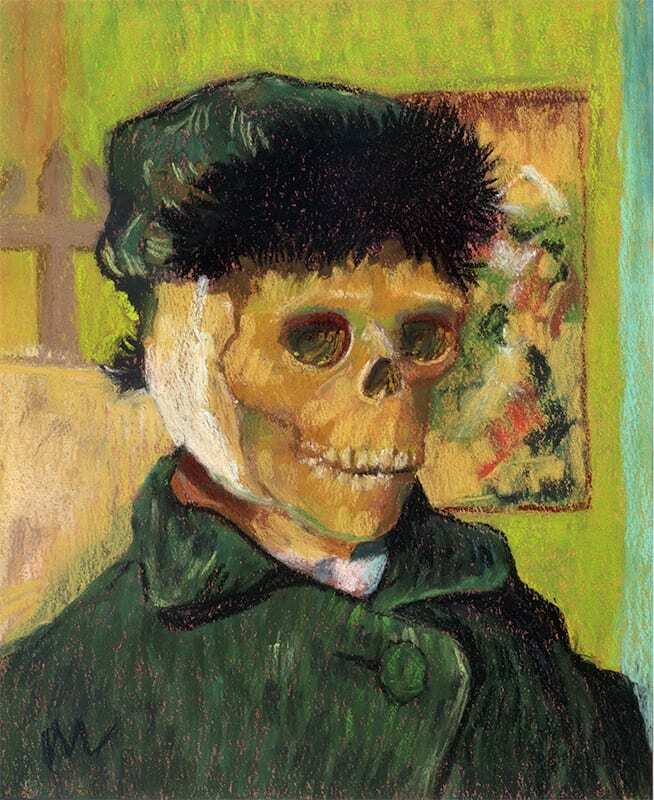 Another in my Old (Dead) Masters series, Vincent Van Skelly is my homage to the wonderful Vincent Van Gogh and his Self-Portrait with Bandaged Ear. 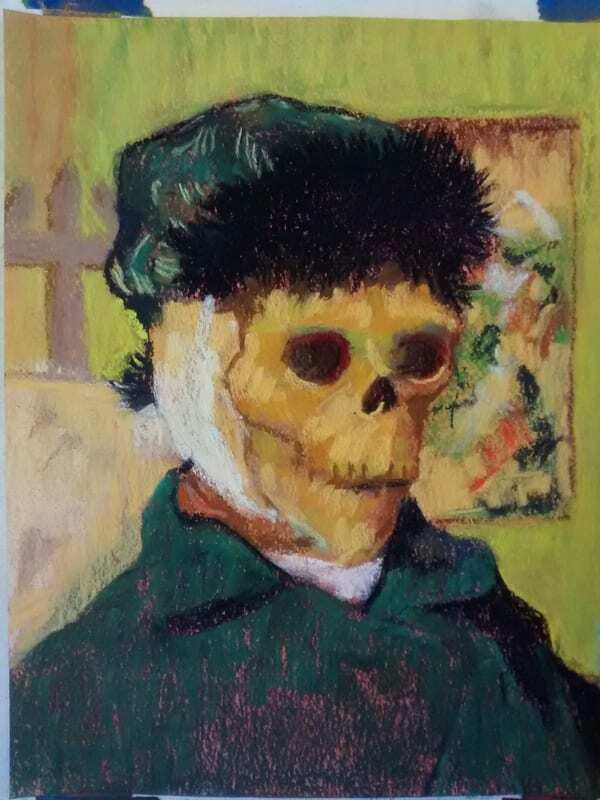 I liked the original piece because it’s all complementary colors, green and red and orange and I liked that he chose to paint himself with his bandaged ear foremost. Like he was saying, here I am, with all my faults, now deal with it. I imagine he was sorry that he’d lost his temper, and in the process, a good friend, Gaugin, because of it. I can relate. I have a quick and violent temper myself, although I’ve been a lot calmer lately. I think it’s because of yoga every day. I wonder if Vincent would have been happier with a daily yoga practice? 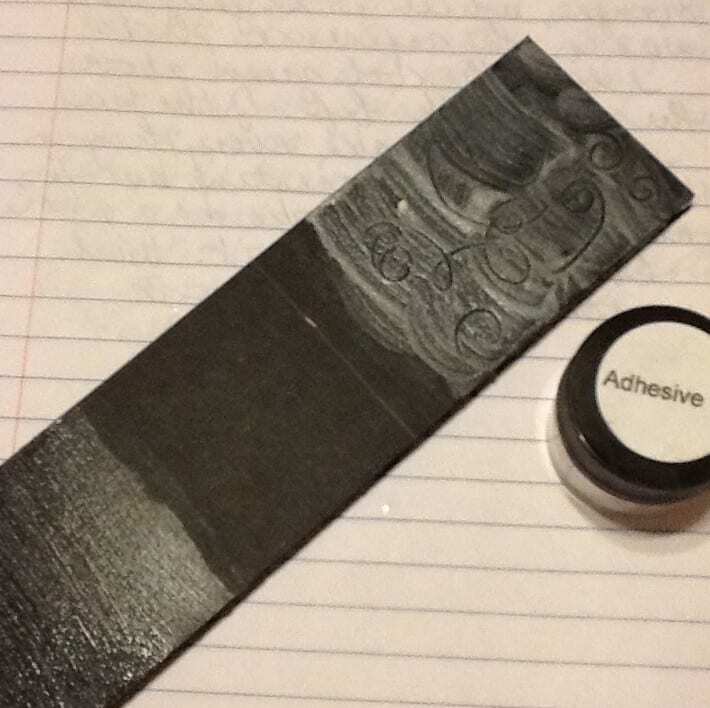 Well, probably non-lead paints would have helped, too. Want to know something interesting? 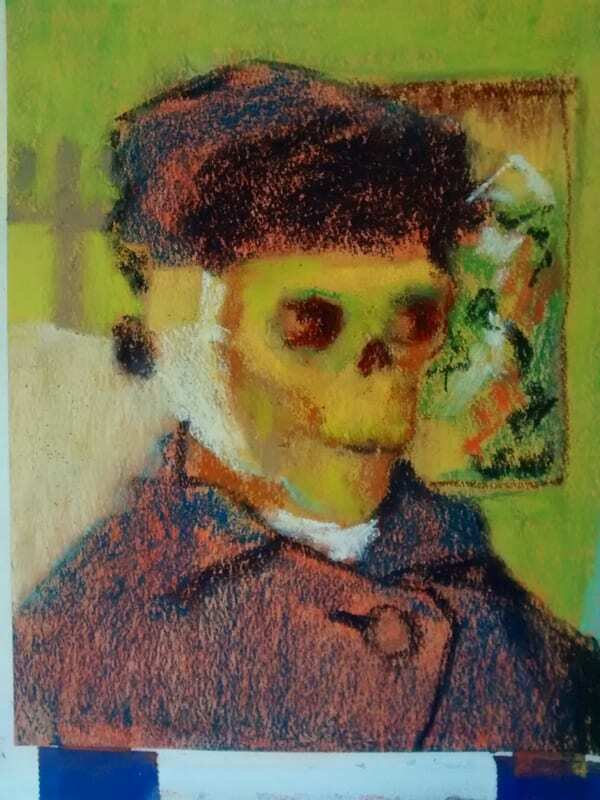 On the page opposite this picture in the book Van Gogh’s Van Goghs, there is a picture of a skull that Van Gogh painted. How do you like that? I’ll bet he wasn’t working from an anatomically correct resin repro either. 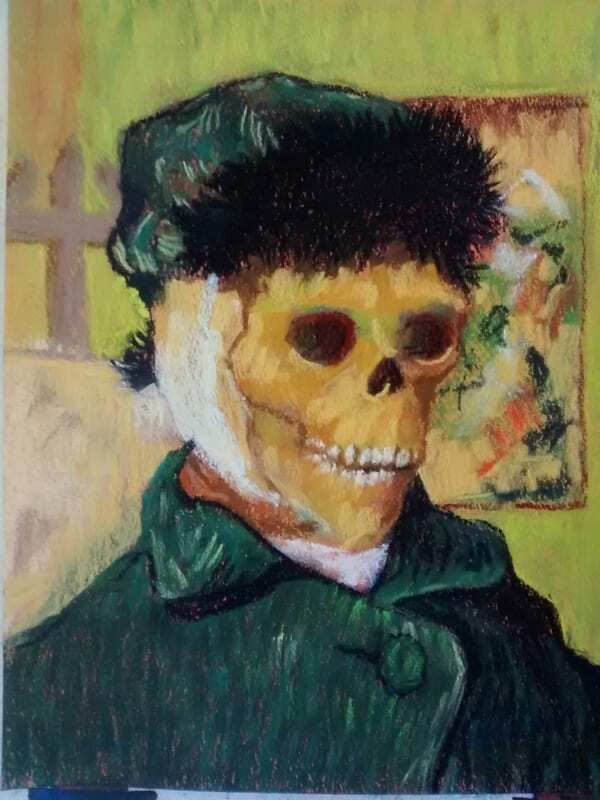 I wonder how hard it was to get a real skull to work with back in those days? 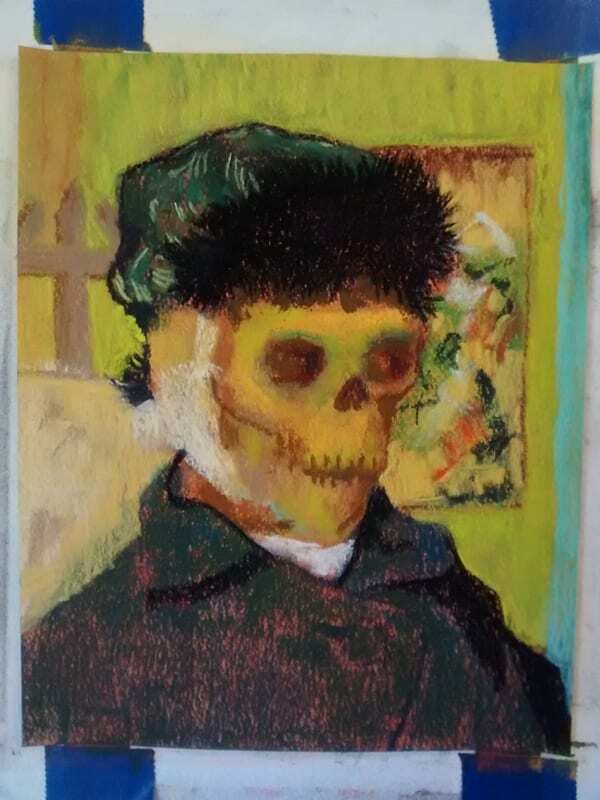 The original Vincent Van Skelly is available in my shop, and also as a signed 8×10″ print, a signed 11×14″ print and a greeting card. 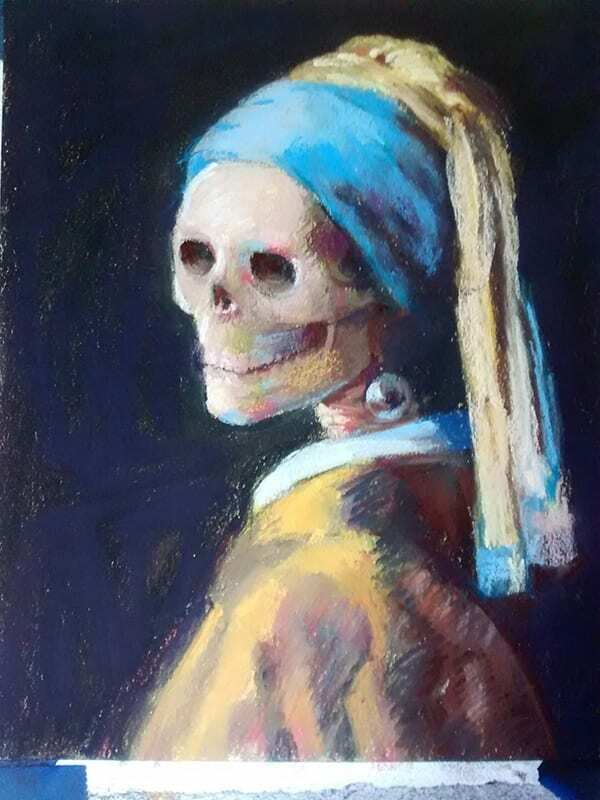 This entry was posted in A pastel a day, Old (Dead) Masters, Pastels, portraits, Skeleton, skeletons and tagged old (dead) masters, pastel, portrait, skeleton, skull, Vincent Van Gogh on August 15, 2016 by Marie Marfia. 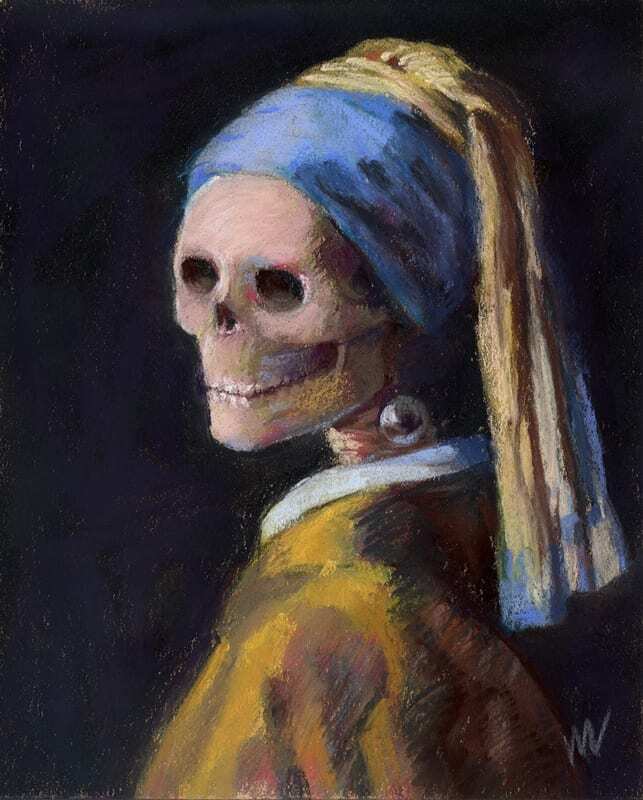 Here’s my take on Johannes Vermeer’s “Girl with a Pearl Earring.” I can’t remember now how I happened to decide on this one for my Old (Dead) Masters series, but it might have had something to do with my scaling my artwork down right now while we wait for our house to sell. 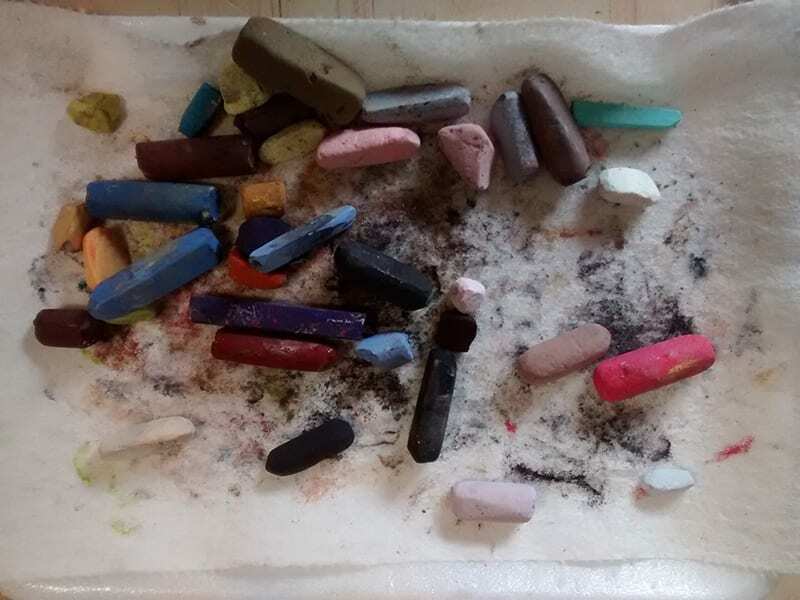 All my studio is packed away and has been for weeks and it just got to the point where I decided I’d rather paint small than not at all! Accordingly, this is a relatively small painting, only 8×10″, perfect for an apartment or tiny house! 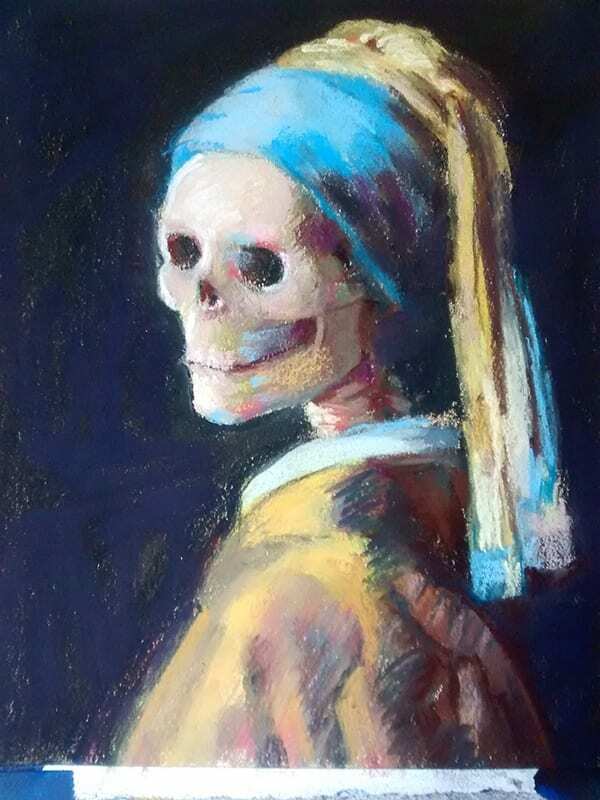 This entry was posted in Old (Dead) Masters, Pastels, Skeleton and tagged girl with a pearl earring, homage, johannes vermeer, old (dead) masters, parody, pastel, portrait, skeleton, skull, spoof on August 7, 2016 by Marie Marfia. Whew! She’s done and I’m so glad. You ever have a project that you want to finish but you just can’t seem to move forward on it? That was me last week. 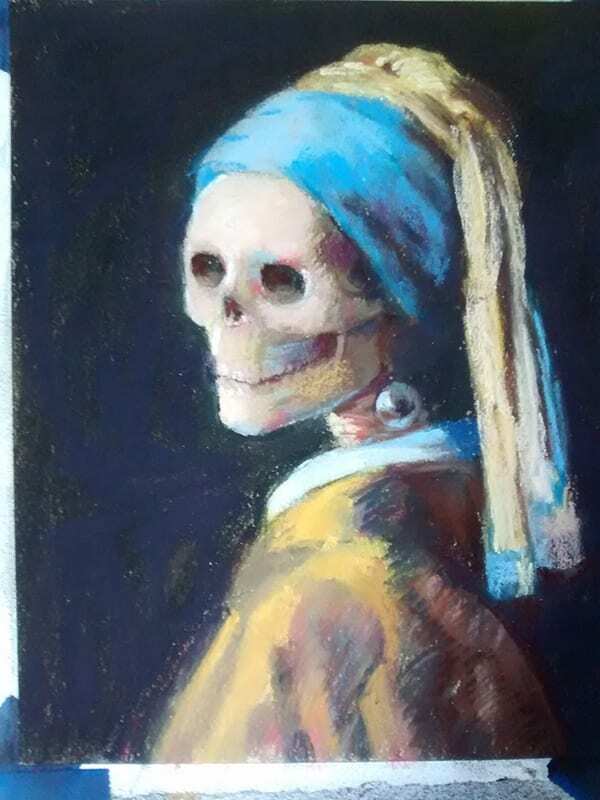 Finally, I sat down and wrote a short piece about a person named Marie who just got down to it and finished the painting she’d been wanting to finish. Then I decided to hold myself accountable by live streaming the process. And it worked! Something about having someone in the room watching me actually do the painting really motivated me to finish it. 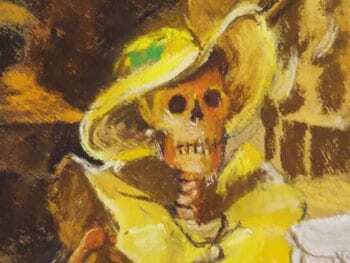 So, I’m very happy to present my beautiful skelly in yellow for your viewing pleasure. See the guy in the back? He’s enjoying her, too. 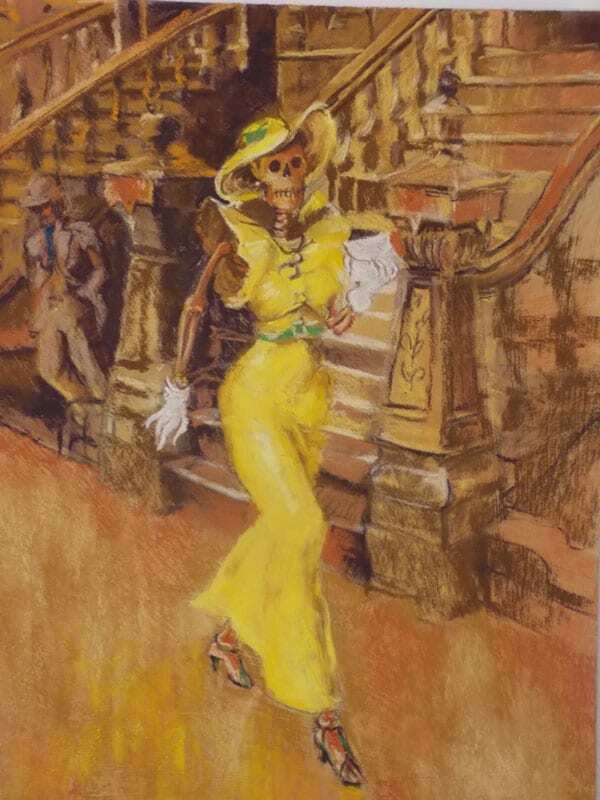 High Skeller, 20×16″ pastel painting on gator board with pumice ground by Marie Marfia. Here’s my Work in Progress pics. And if you’d like to purchase my darling girl, you can do that in my shop. She’s all dressed up and ready to go! She’s also available as a 8×10″ print or a 5×7″ greeting card. 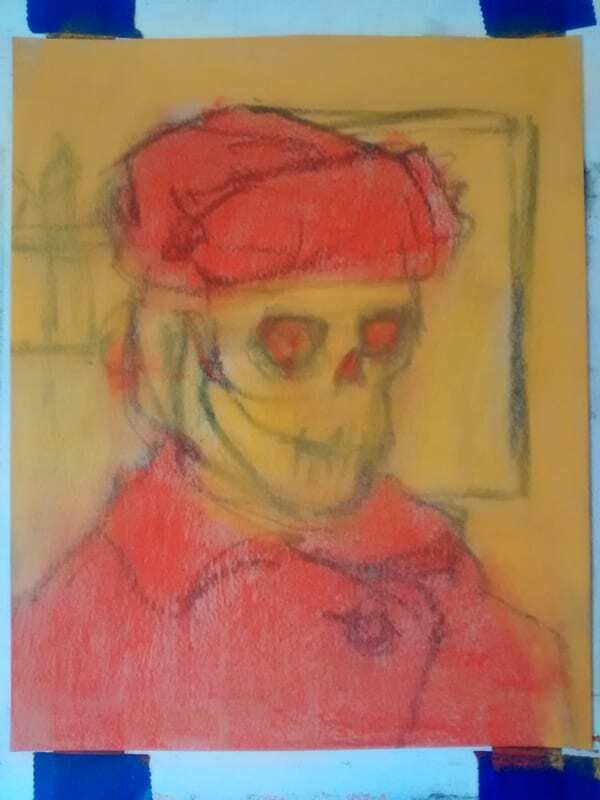 This entry was posted in A pastel a day, Old (Dead) Masters, painting a day, Pastels, Skeleton, skeletons and tagged art, Marie Marfia, old (dead) masters, painting, painting a day, pastel, pastels, skeleton, Skelly on June 24, 2016 by Marie Marfia. 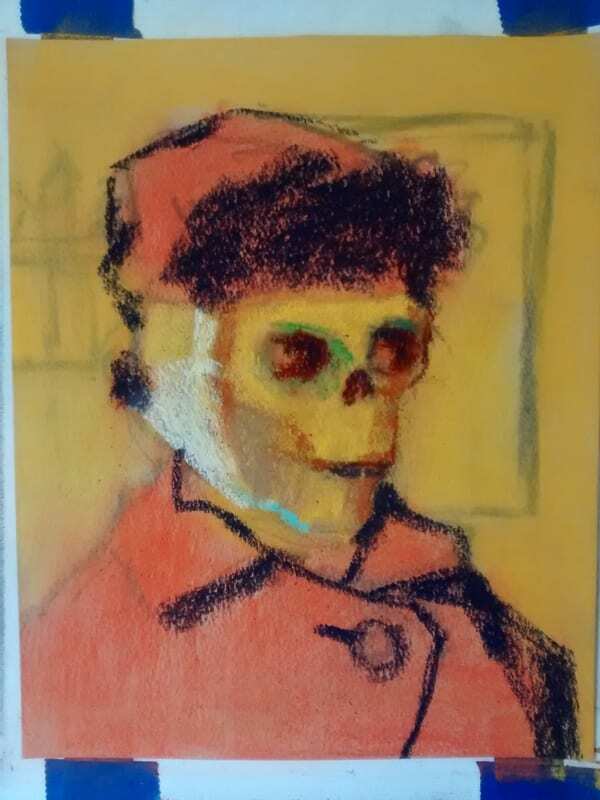 Ground Skel, 16×20″ pastel on gator board with pumice ground, by Marie Marfia. 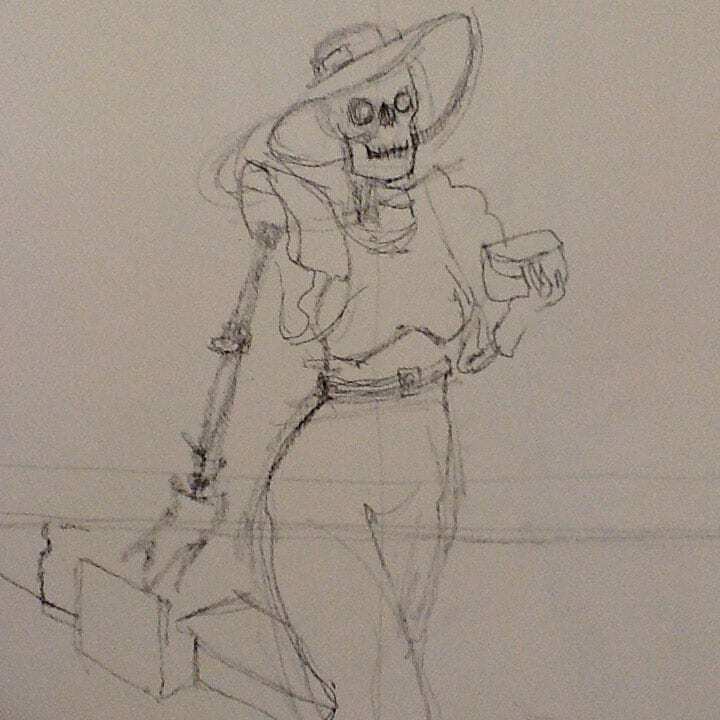 I thought about Ground Skelly, but then I went with Ground Skel because I love puns. This piece was a joy to build, from start to finish, but I think I’m definitely going need more blue pastels soon! 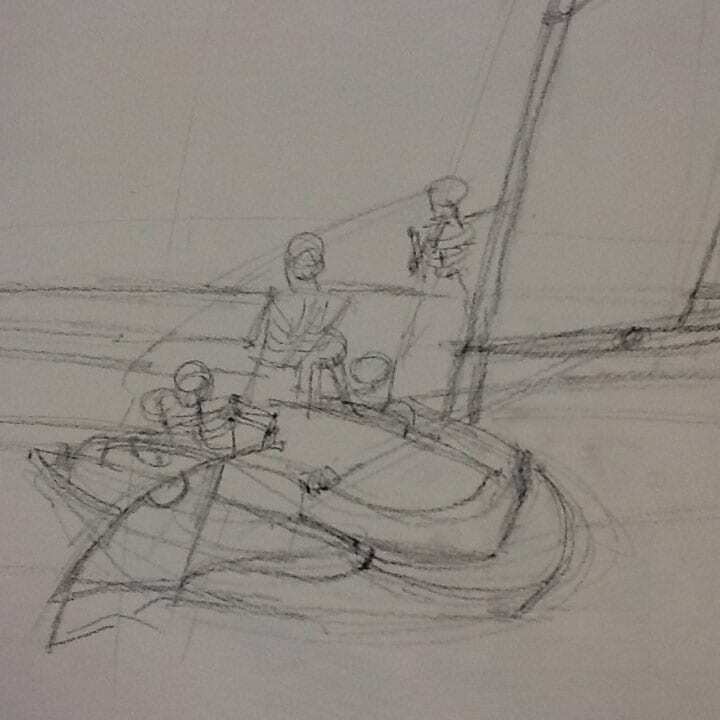 I love the swoop of the sloop and the way all the angles work within the composition. The clouds make this cunning dotted line across the sky and the waves roll forward like folds in a blanket. Steve asked me what was holding the sailors’ pants up and I said it was the same magic that allowed them to sail a boat! 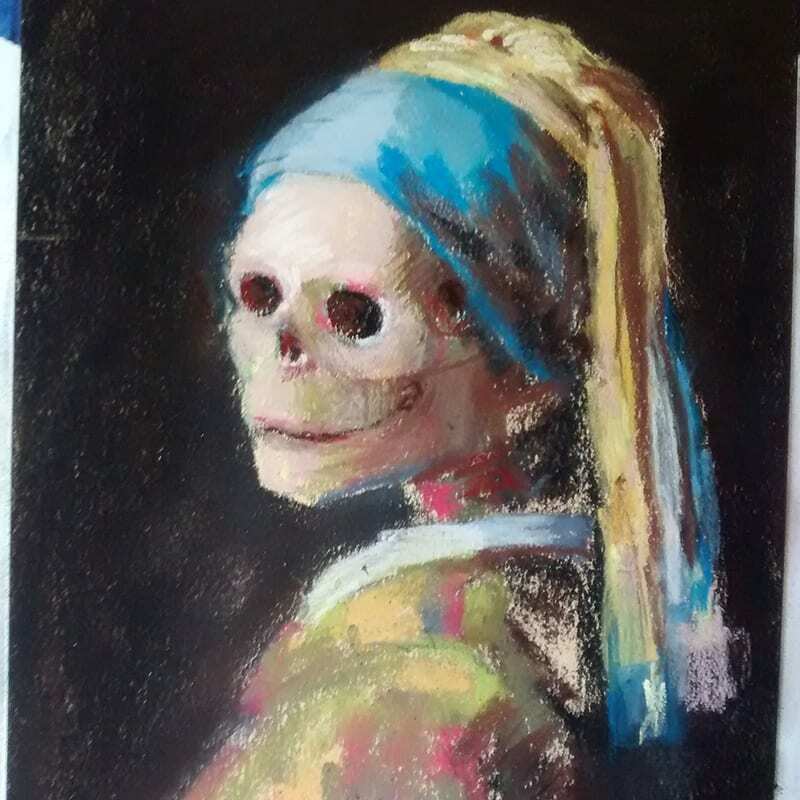 I have to tell you, this Old (Dead) Masters series has given me so much pleasure, just in the few that I’ve done. I can’t wait to get on to the next one and see what I’ll learn from it. Here are a couple work in progress pics for your viewing pleasure. Here’s the link to the original in my shop, and here is the greeting card. I’ll have prints available at The Starving Artist and The Attic soon. 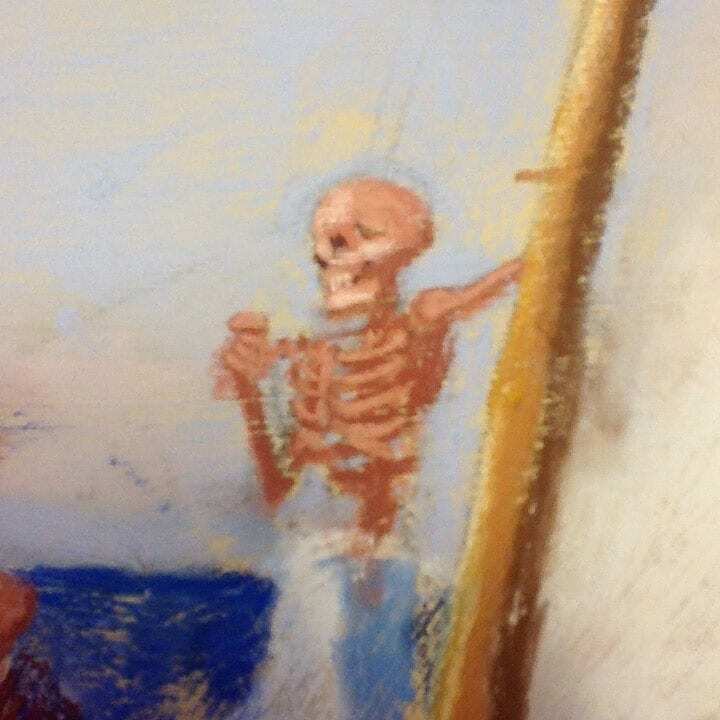 This entry was posted in Old (Dead) Masters, Pastels, Skeleton, Skeleton Crew, skeletons and tagged buoy, Edward Hopper, Ground Swell, ocean, parody, pastel, skeleton, skeleton crew, sloop on May 23, 2016 by Marie Marfia. This one is going to be great! That is, I hope it’s going to be great. 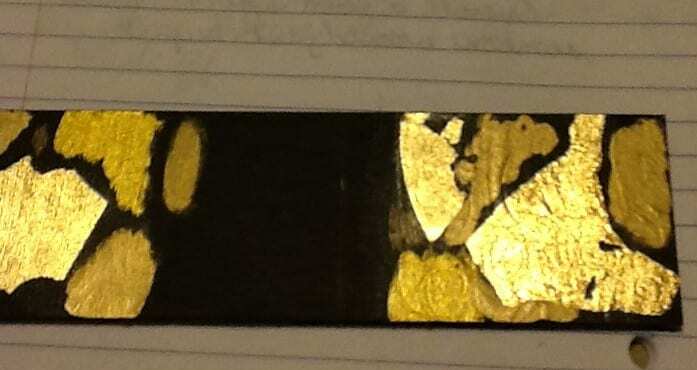 I love Gustav Klimt’s paintings and all the beautiful gilding on them. 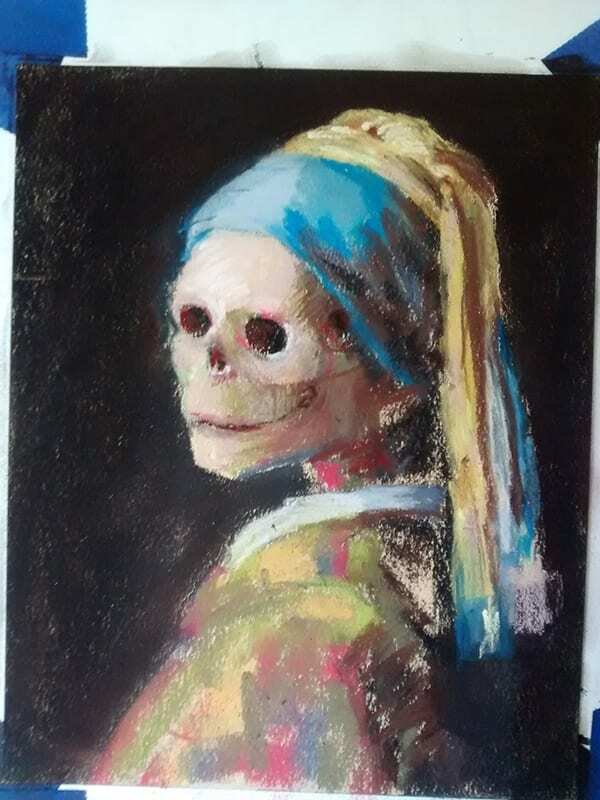 A friend suggested I do a skelly painting based on The Kiss and I thought, why not? It’s iconic, it’s romantic, it’s gold! 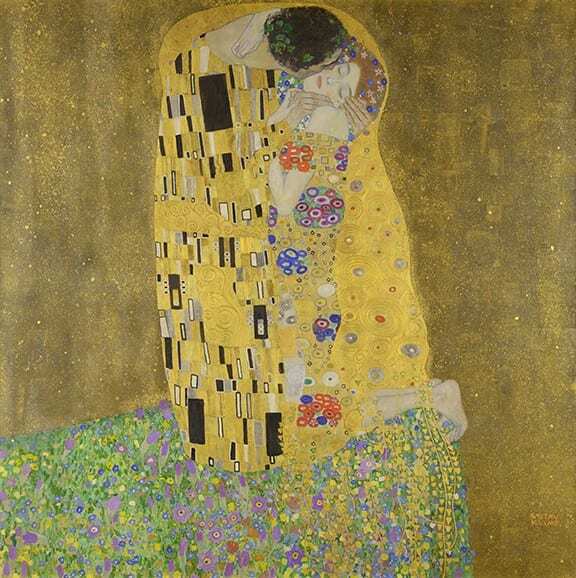 The Kiss by Gustav Klimt, subject of my next Skelly painting! This image courtesy Wikipedia. 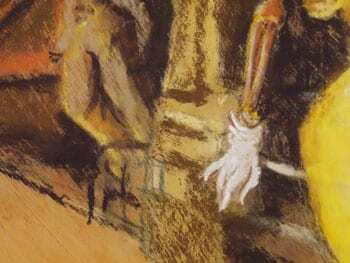 The gesture drawing on 18×18″ black gator board. I love this piece already because of the patterns in the ground and on the clothing. 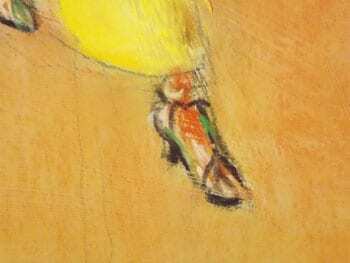 I love the brush strokes in the background. 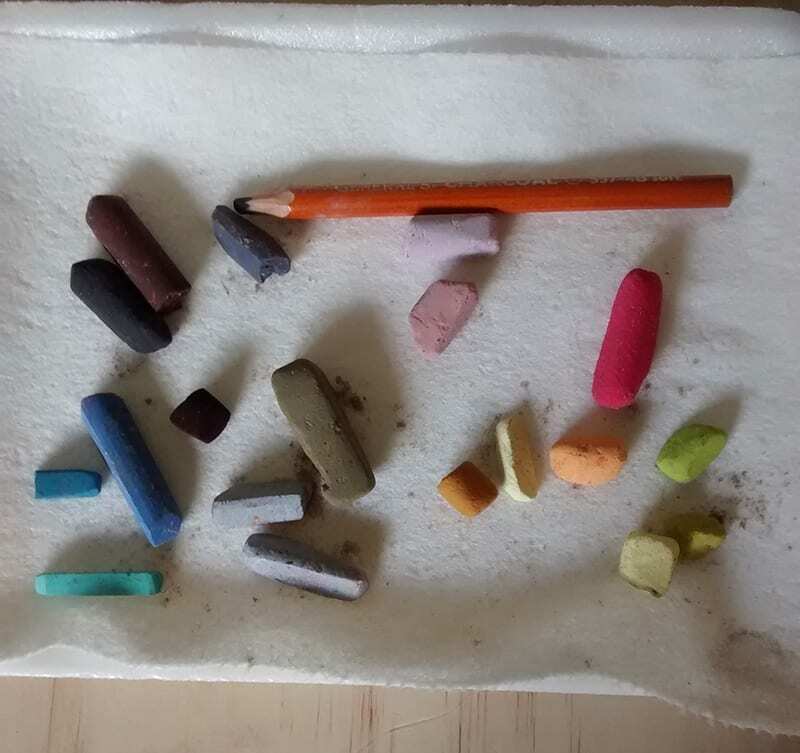 I’ll start with the bones first, then work on the green ground with all the flowers, put in all the clothing details that are in color, then last, but not least, I’ll put the gold in. 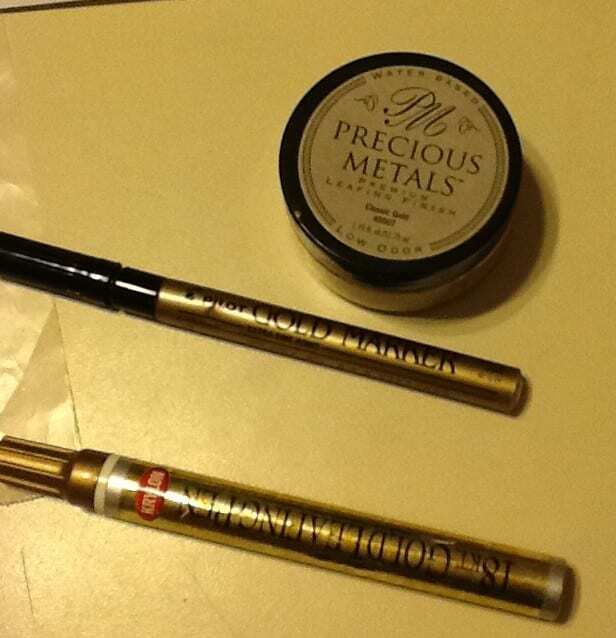 I have some gold leafing supplies, plus gold paint, plus gold metallic markers, so I ought to be all set. I am probably too excited about this, but whatever! I’m just going to let it wash over me while I work. Stay tuned. 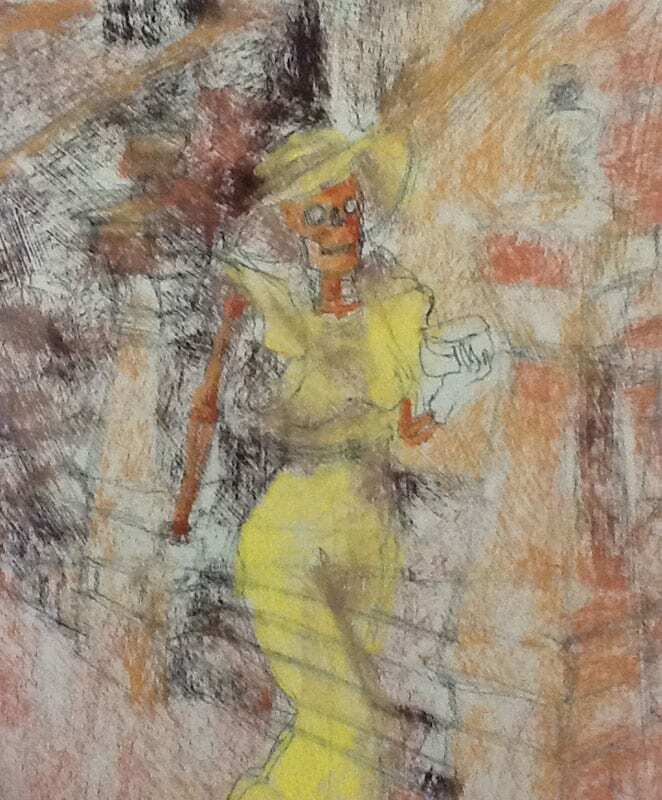 This entry was posted in A pastel a day, Old (Dead) Masters, Pastels, Skeleton, skeletons and tagged old (dead) masters, painting, pastel, romantic, skeleton, The Kiss on November 17, 2015 by Marie Marfia. 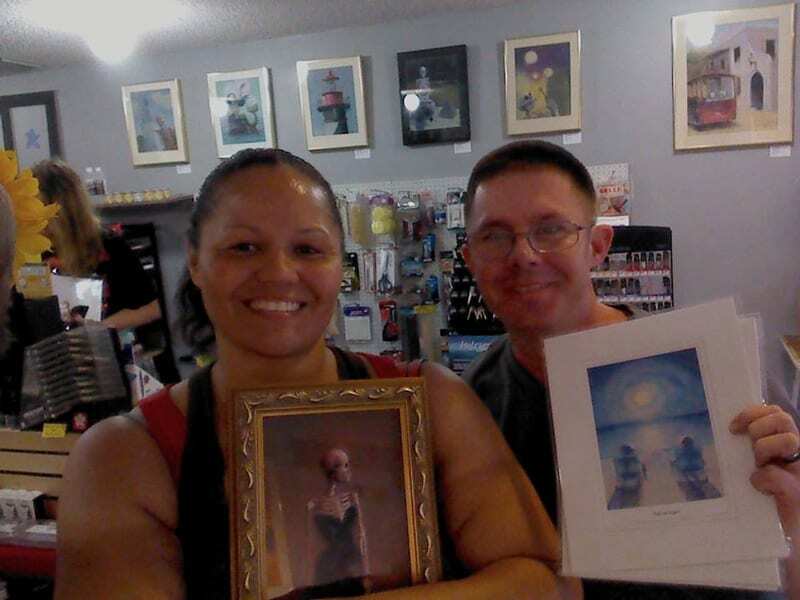 Stephanie and James with Madame X-Ray and prints from my show at The Red Sable, October 2015. 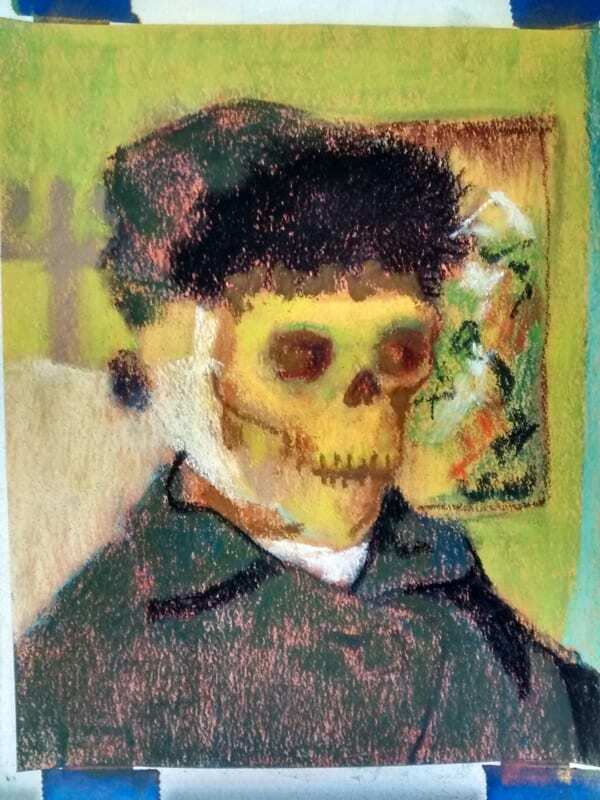 Congratulations, Stephanie and James, on your newest acquisition to your skeleton art collection! 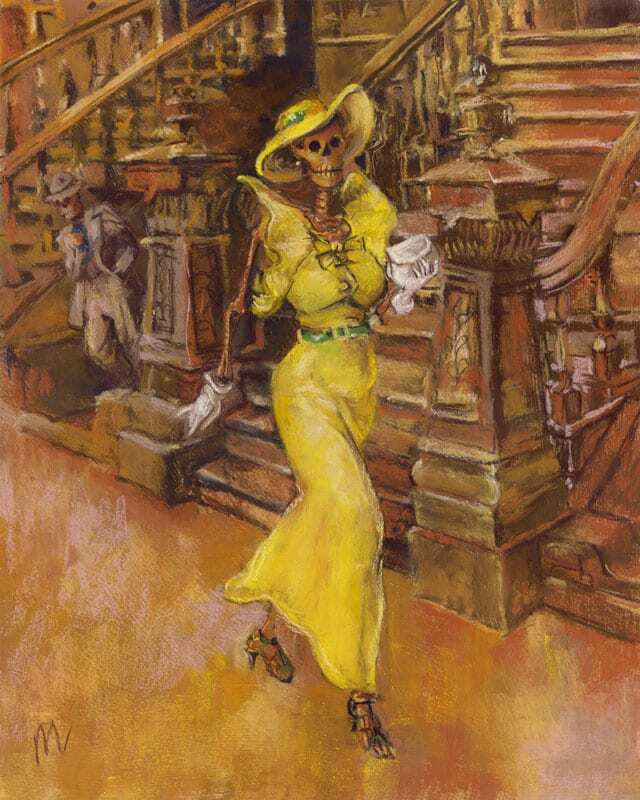 It makes me happy that you loved Madame X-Ray so much that you just had to take her home with you! May she bring you joy. 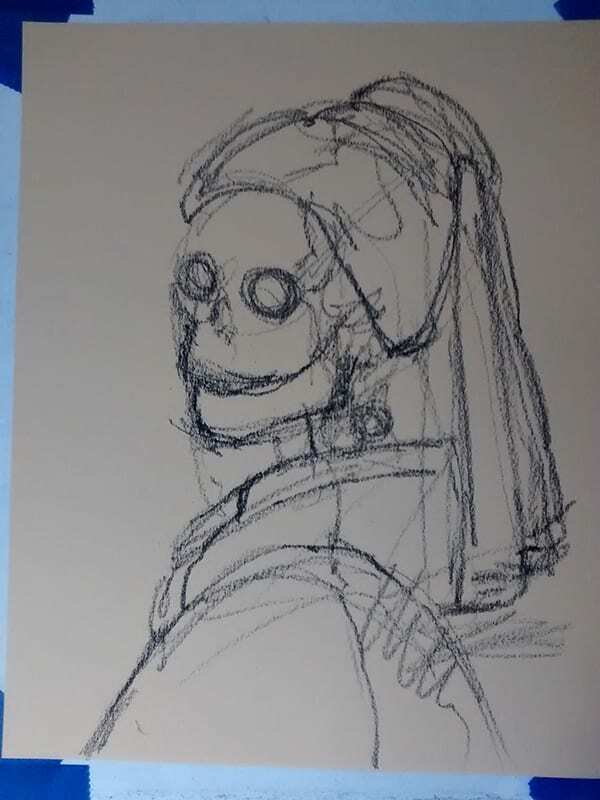 I enjoyed talking with them about skeleton art and I’m excited about making plans for next year’s Day of the Dead Festival in St. Augustine, Florida. It’s gonna be great! Stephanie and James, hope to see you there! 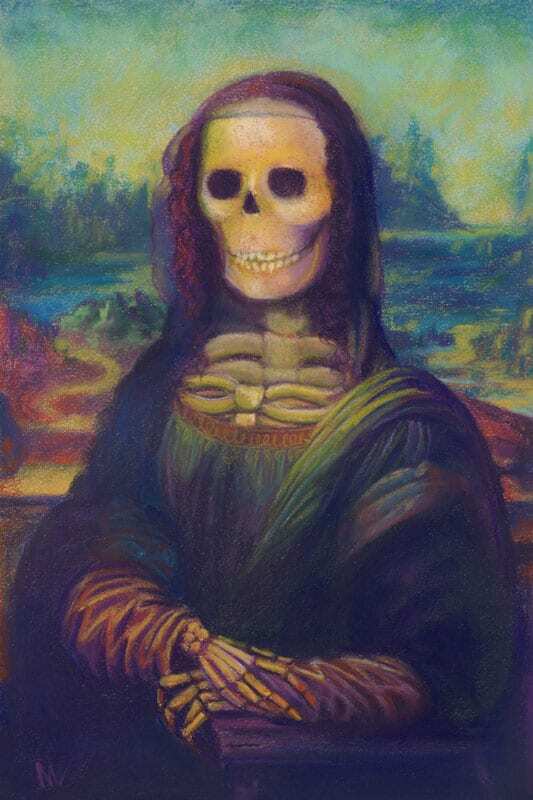 Have you signed up for my newsletter, Bone Appetit? It’s a weekly email with the best of my blog along with subscriber only specials for prints and original art work, plus when you sign up you’ll receive a printable Hello Sailor card and envelope! Just put your email in the form on the right and you’re in! Hope to hear from you soon! 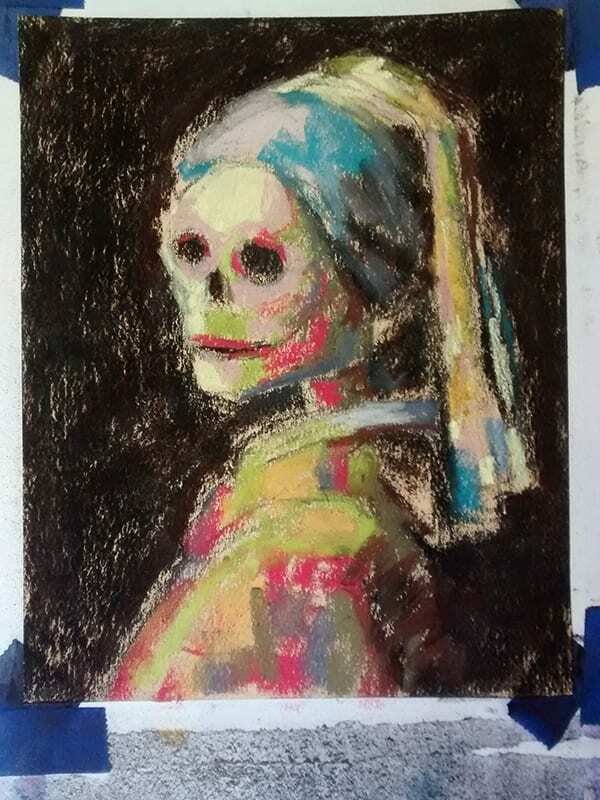 This entry was posted in A pastel a day, Old (Dead) Masters, Pastels, Skeleton and tagged Day of the Dead Festival, Florida, Madame X-Ray, pastel painting, St. Augustine on November 1, 2015 by Marie Marfia.